Newsletter No.007 Weird 230SL, Mitsubishi take over? Short newsletter this week. At the last minute I got some FREE tickets to the dress rehearsal for the opening ceremony for the Olympics. It is on Saturday night and guess when I normally finish the newsletter? So as you can imagine I am off to Sydney in the morning. Maybe I could have headed this "What were they smoking" Have a look at this. It looks like the sort of conversions that were done on quite a few English cars in the 60's. But, as you can see, it is a LHD car. The number plates are Spanish and the car is apparently for sale. A proper 230SL should look like this. As I have mentioned a few times, this newsletter is for you guys. So, input from newsletter readers is both sort after and appreciated. Mike Stock has suggested a get together of Newsletter Members at a fund raising show he is organising. retired teachers to assist families in the outback who rely on School of the Air for their children's education. - Ted Egan, an Australian performing icon. player in Australia. Is just back from an American tour. presenters to that of Tina Arena. you require, we will make sure you have your own MB table. Unfortunately, I will be in Queensland at the Indy Car Races on the Gold Coast on that weekend. So I will have to leave it to Mike to organise the get together. It would be nice to have a regular get together. A mailing list that I am subscribed to in the USA have a BBQ once a year and it is a great success with people driving amazing distances just to cremate some meat and talk cars with people who understand them. Quiet week this week. Same list as last week. I have the 560SEL advertised in the Sydney papers this weekend and am taking it to the Olympic dress rehearsal. The 600SEL has had a reconditioned transmission fitted to it in the last few weeks. Check out our cars for sale here. Here is a shot of the 380SEC that we have for sale. Check this out. 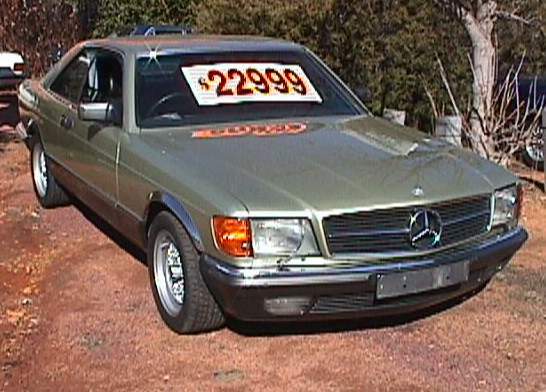 The passenger safety cell was certainly alive and well back in 1971 when this W108 280SE was built. It belongs to a chap I know in the US. It was parked on the side of the road behind his Ford Explorer. Some out of control Mexicans rammed the back of the Mercedes with Ford F150 pickup (Ute) and it then rammed the Explorer. Note the back window is not broken! DaimlerChrysler expects to announce the results of its meetings with Mitsubishi Motors Corp, (MMC), the Japanese automobile manufacturer this week, a company spokesman in Stuttgart announced. Meetings have not yet been concluded. The talks centre on Daimler-Chrysler's 34 percent investment in MMC, already agreed upon, against the background of current unfavourable developments at the new partner.